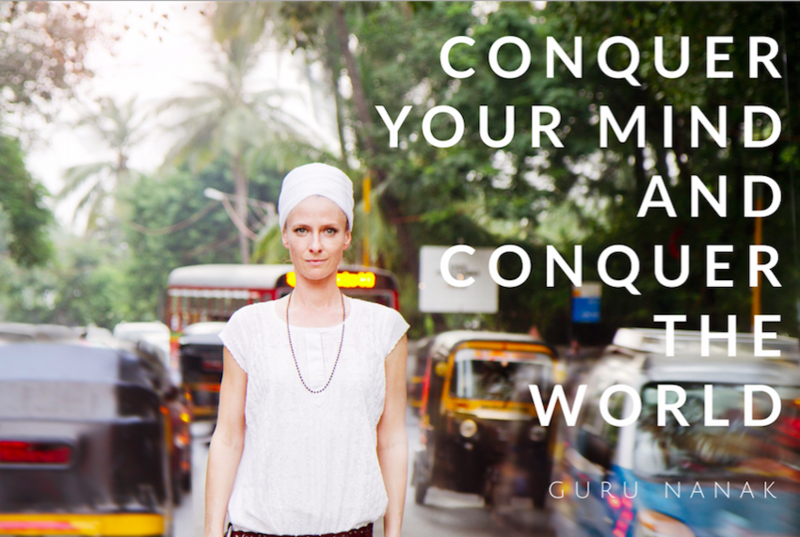 zਮਨਿ ਜੀਤੈ ਜਗੁ ਜੀਤੁ – Man Jeetai Jagjeet – Conquer your mind and you conquer the world. These are famous words by Guru Nanak that make you think or actually encourage us to stop thinking. When the mind stops the world disappears. Most probably your mind is now going: What?! That’s not possible, how can the world disappear? Look at it this way. We constantly project our thoughts onto the world we see around us, we give meaning to the things we see according to our understanding and preferences based on previous experience a.k.a. the past. Thus you could say, we do not see what is really there, we see what we think, we see the projection of our own thoughts, we see the past. Our minds tend to go outwardly all the time, keeping us trapped in psychological time and in a lot of fear based judgement and comparison, that, if we are honest about it, don’t really make us feel good, rather the opposite. As long as we don’t turn our attention inwards, back to the source, to the One, we stay trapped in the ‘material’ world, the illusion, or maya as the ancient teachers called it. Instead if we do go inward and retreat our attention from the world around us, we can start to see and observe our mind. You come to understand, through your own direct experience, you are not your mind. When this happens you will start to find another kind of happiness and fulfillment, one that has nothing to do with the world, with accomplishments or success, money or health, all the things so highly thought of in the world, things that keep us busy and running all the time. We then find our true home and inner peace. We need to understand how the mind works and make it follow us instead of vice versa. How? Through meditation! Does this happen overnight? For some it does, but most of us need a spiritual discipline to overcome habits and belief systems that have been part of us for many many years. We need to create a new habit that will help us to again see with clarity. We need to purify our minds by learning to redirect our focus and give it new ‘things’ to do then rather just repeat what we know. Since old engrained habits can be really strong and stubborn we need leverage, we need a technology that raises us above the long beaten track to give us a new perspective, a greater outlook. And that my friend, is exactly what Kundalini Yoga as taught by Yogi Bhajan is. It is a precise, powerful and sacred technique that will allow you to make definite changes in the way you perceive yourself, your life and thus ‘the world’. It helps you to be in the world, but not ‘of’ it. Especially because you do not need to practice hours on end. An 11 minute meditation each day can already give you a life changing experience. You might want to try this beautiful Kundalini Yoga Meditation for Mental Purity. Consistent practice will make your mind crystal clear and will eliminate mental impurity when done correctly. This meditation will develop the healing power within you.